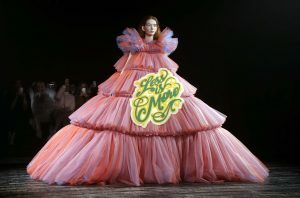 Viktor & Rolf debuted our entire 2019 mood board in couture form. There was once a time when slogan t-shirts were enough to get all our feelings across. 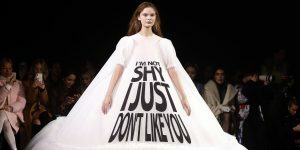 But if you’ve logged onto the internet at all in the year 2019, you know your little graphic tees aren’t sufficiently expressing your rage anymore. 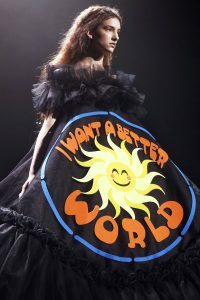 It’s time to go big with slogan couture instead. 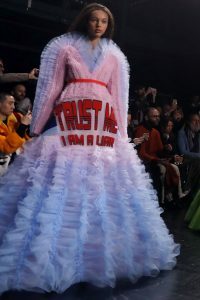 Giving us the statement pieces we didn’t know we needed, Viktor & Rolf debuted a collection of slogan gowns today at Paris Couture Week. 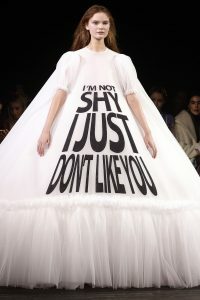 With messages like “I’m not shy, I just don’t like you,” “Sorry I’m late, I didn’t want to come,” and “NO,” the voluminous gowns are here to turn us all into the walking memes we aspire to be in the Year of Our Lord 2019. For when you’re walking into another meeting that could’ve been an email. 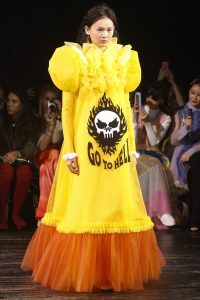 A walking mood board for the year 2019. 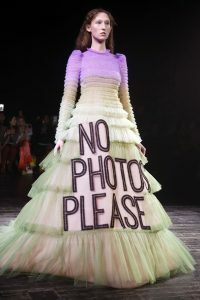 An ironic look for when you’re begging every person within a 5-mile radius to take a good Instagram of you. I’ll take one in every color, please. 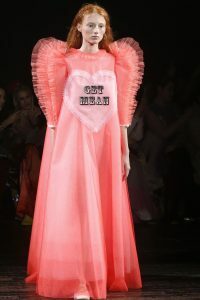 A romantic Valentine’s Day dress you can wear year-round. 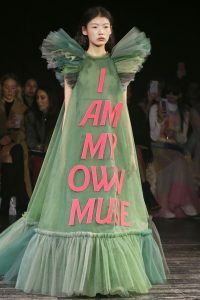 One of the collection’s more versatile slogan gowns, wear it to your next protest, your ex’s funeral, or when they tell you “guac is extra” in line at Chipotle. Perhaps someone will get inspired for their 2020 campaign slogan. For when nobody’s liking your Instagram. For when people ask you for dating advice. 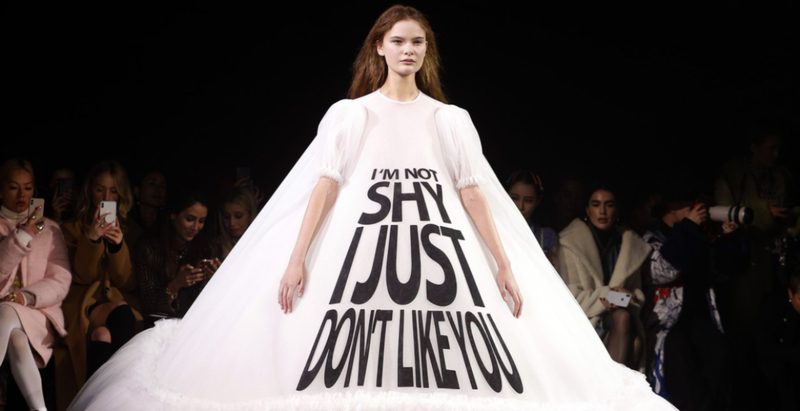 A day-to-night dress for when you’re scrolling through the news on your phone. The three most romantic words in the English language. 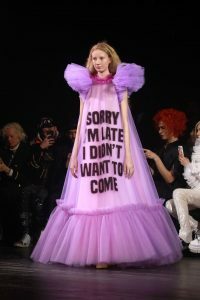 And finally, an everyday lewk that works for every single occasion. 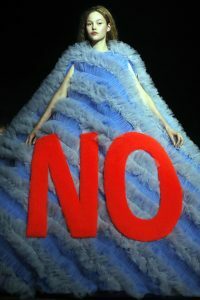 From fantastical feathers to the new bucket hat, these are the key looks to have on your radar. The trends, tips and tricks to summer-proof your beauty look. In 2019, Logomania is here to stay, at least according to Kith and Versace. Malaysian fashion designer Kit Woo shares his favourites this season. But it doesn’t bother her. From Victoria Beckham’s powder box to Chanel’s side pack, these are the styles to invest in this year.